When I was a drum major, I started writing down all the random pieces of advice I discovered during the summer. I titled the list "Emily's Rules for Drum Majors," and I think I got as far as three items – the only one of which I still remember is, "You can never have too much field paint or toilet paper." While that little rule is just as true now as it was then, it is hardly the most profound thing I learned as a drum major. 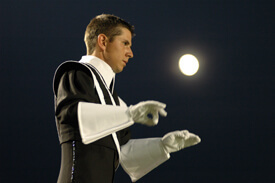 As with most things in life, I learned nearly all of what I know from making just about every mistake you can imagine, and write this in the hope of helping new and experienced drum majors alike avoid my pitfalls. What most people see of drum majoring is the part that happens on the field: leading the drum corps through the show, calling commands, and accepting medals at the end of the night. Seems like a pretty sweet gig, right? Well, unfortunately, most of the crowd doesn't see what drum majors (DMs) do all day long, which is primarily manage the rest of the corps members. Being a good DM is about being a good manager of people, and much of the advice I wrote to young administrators applies to drum majors as well. I should note here that there are as many approaches to drum majoring as there are drum corps, and that the most important part of being a good drum major is making sure that you are on the same page as your administrative/management staff in terms of your role and responsibilities. Make sure you know how much you're supposed to enforce the rules. Some directors prefer not to have their DMs doling out push-ups, whereas some leave corps discipline entirely up to the DM's discretion. If you are responsible for waking up the corps, administering first aid or managing the volunteers, make sure you know the whens and hows from day 1. If you will be held responsible for other members' screw-ups, make sure you know that too! When conflicts arise between you and other corps members, you want to make sure the administrative staff will back you up. By the same token, don't become overzealous in your application of your new-found powers. Most corps members have an understanding of drum majoring that is not much more complex than the average fan's, and don't understand that it is less about the powers you gain than the responsibilities you end up saddled with! Yes, you can now yell at someone for not being out of the gym on time when leaving a housing site, but you must now also monitor all members all the time to be sure they have the necessary information and are moving through the day as they're supposed to, and set a good example at all times. Yes, you may now get a seat on the bus to yourself, but you have to wake up in the middle of the night to tour the housing facility and direct members to the sleeping area. Yes, you get to wake the corps up, but you also have to get up 15 minutes earlier than everyone else, and tell people where to go and what to do – after you were probably the last one to get to bed in the first place. Yes, you might get to run stretches and conditioning, but you also have to be awake and ready to go in the morning. Get the picture? Recognize right away that drum majoring has its perks, but it also has responsibilities–and there are a lot of them. The primary thing most new drum majors have trouble with, once the initial gleam of the job has worn off, is the idea that you have to be on duty literally all the time. You can't ever not answer a question or choose not to deal with someone you don't want to talk to right now. You can't ever snap at someone because you're stressed, or busy, or tired, and you will always represent the corps a little more so than everyone else when you're at a show. Get used to the idea that your time is pretty much never your own, and that you will answer the same questions about 20,000 times a day. Right now, this may not seem like that big a deal, but halfway through the summer, when you're sick of being on the bus with the same whiny folks, it'll be a huge deal. If you are lucky enough to have a co- (or head or assistant) drum major, remember that you are a team. There will be no one else on tour who can understand your particular brand of agony, and if you learn to work together and cooperate, you can have the privilege of being part of an efficient and effective team - and make a good friend besides. If you foster a sense of competition and jealousy between one another, well, you've cut off your nose to spite your face: not only do you come out looking the worse for wear, but you're subjecting yourself to a lot of unnecessary pain. Be each other's best friend, because there will be days when it'll seem you're each other's only friend. On days when your co-DM is driving you nuts, step back and remember that this person is being subjected to the same crushing stresses you are. When your co-DM makes a mistake, be the first person to step in behind him or her and help resolve the situation. Defend your other half if the other members start whining. And when the other members try to play you off one another-because rest assured, they will—be sure to communicate, stay on the same page and back each other up. Be each others' better halves, be worthy of one anothers' respect and remember that one is the loneliest number (that's why there's two of you!). As a drum major, remember to be a good friend to all the other members. They will come to you with their problems and complaints, and the things they say will probably sound a little petty or trivial compared to what you're dealing with. Remember that a year ago you would have been complaining about the same things, and don't belittle their concerns simply because your experience has changed. Don't yell or demand – requests that are made reasonably, with respect, will be met with a much better response, and on the odd occasion that you do need to speak harshly, your words and tone will carry much more weight. Earn respect through your actions, by being a good example and dependable member, rather than demanding it because of your title. Be positive and encouraging most of the time, be fair in your judgments and interactions, and remember that the average member doesn't necessarily need to know everything you know. Most of all, remember to put yourself in your members' shoes and remember where you came from–the same place they now march. Have respect for them, and they will respect you; lead them well, and they will follow. Emily Tannert is a sophomore music education/percussion performance major at Louisiana State University in Baton Rouge, La., and holds a journalism degree from Northwestern University. 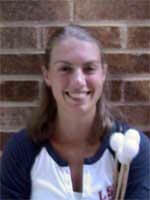 Emily aged out of the Glassmen in 2003 and was assistant tour manager for the corps in 2004 and 2005. You can contact Emily at emily@imoses.com.